Thoroughly revised and now enhanced with color artwork, the new edition of this premier reference continues to offer the latest information on the diagnosis and management of reproductive endocrine disorders. National and international leaders from the field of reproductive endocrinology—including 30 new authors—equip you with coverage that encompasses the full spectrum of reproductive pathophysiology and disorders, from pregnancy and birth to reproductive aging. Full-color illustrations and new drawings provide a real-life depiction of basic cell structures and endocrine responses for a better understanding of the material, while new chapters explore the issues shaping today’s practice. As an Expert Consult title, it includes convenient online access to the complete text of the book—fully searchable—along with all of the images, and references linked to Medline at www.expertconsult.com. Covers the full spectrum of reproductive pathophysiology and disorders, from pregnancy and birth to reproductive aging. 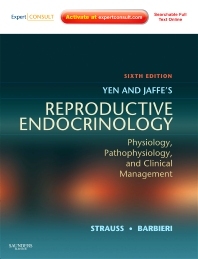 Includes the work of leaders in the field of reproductive endocrinology for guidance you can trust.